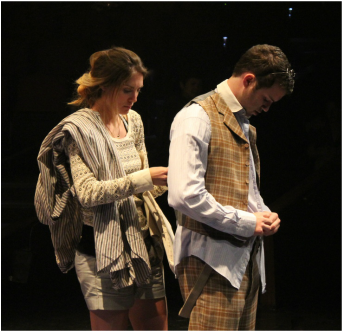 ​Emma Scholl, costume designer and technician for theatre, dance, and film, is the costumer for the Department of Dance at the College at Brockport, State University of New York. She has recently presented work in the STRUTT Wearable Art Show and designed costumes for an adaptation of The Bacchae at SUNY Oswego. Much of her design work has been seen at the Rochester Fringe Festival, including her wearable art collection. Since moving to Rochester she has collaborated with Bill Evans Dance, Nicole Kaplan, Mariah Maloney Dance, Stevie Oakes, Red Dirt Dance (Karl Rogers) and Vanessa VanWormer. Previously she has designed costumes for Bloomsburg Theatre Ensemble, Hangar Theatre, the Milburn Stone Theatre, and Steel River Playhouse. She has also worked with faculty, student, and guest choreographers designing dance and theatrical costumes at Bloomsburg University, Bucknell University, and Florida State University. Recent theatrical design credits include: The Bacchae, Little Shop Of Horrors, The 39 Steps, 4000 Miles, Last of the Red Hot Lovers, Full Gallop, Dead Man’s Cell Phone, and Julius Caesar. She holds an MFA in Costume Design from Florida State University.